My 'who do I want to be when I grow up' angst started young. I was a blocky, freckly ginger kid, a bit too clever for my own good, but not clever enough to keep my mouth shut around people who didn't like that. Even as I longed to have more friends I refused to play along. It didn't make for a front row seat with the popular girls; and even when my mouth didn't get me into trouble, my "bitchy resting face" did. I was fifteen when I discovered the power of food and suddenly I wasn't blocky any more. Food, my dysfunctional friend, became my wing woman, accompanying me to sixth form and then stowing away with my books and Breville sandwich toaster when I headed to university. She's been there ever since, if I'm honest, although she (unlike me) has mostly learnt to stay silent in recent years. It wasn't until I discovered The Edible Woman, during a particularly bad month in a particularly bad year, that I realised what was wrong. The thing I thought was giving me a sliver of control was actually controlling me. 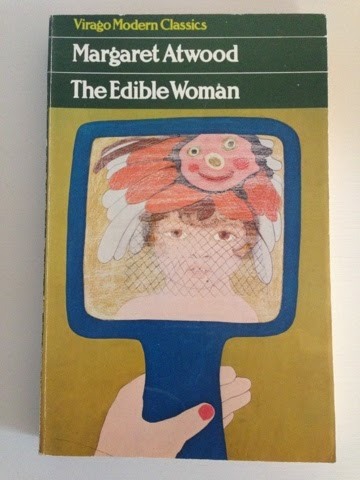 If you're not familiar with it, The Edible Woman tells the story of Marian, a woman determined to be ordinary, to belong, to fit in. She gets engaged, she plans her wedding, she waits for 'normal' to start, until she finds she can literally no longer stomach it. Her inability to eat starts with red meat, when she suddenly finds herself identifying with the steak her fiancé is eating, but soon expands to include vegetables, eggs, cake, everything... Because what Marian thinks she should want, and what she does want are two completely different things. And, as she waits to live the life that's mapped out for her, far from feeling consumed with passion, with enthusiasm for what awaits her, she can't shake the feeling that she's being consumed. The Edible Woman was the first book I read that made me see that. Our relationship with food is about many things, but what it's not about is eating.